The Advox Netizen Report offers an international snapshot of challenges, victories, and emerging trends in technology and human rights around the world. This report covers news and events from February 8-14, 2019. 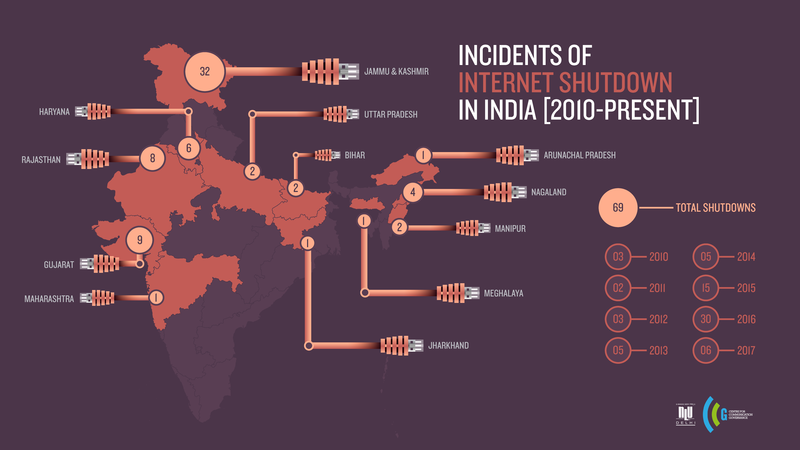 Since the start of February, authorities in at least three Indian states — Rajasthan, Jammu and Kashmir, and Manipur — imposed temporary shutdowns of all mobile internet services, all in apparent response to political tensions. Protests in Manipur against a controversial citizenship amendment bill triggered a mobile internet shutdown on February 11, as demonstrations reached boiling point, with authorities imposing a curfew after protesters began blocking roadways in 24-hour shifts. Proposed and promoted by the Modi government, with national elections fast approaching, the bill has sparked criticism in border states like Manipur (which shares a border with Myanmar) that have large populations of migrants from other parts of Asia. The citizenship amendment bill would create a new pathway to citizenship for people from certain religious groups who migrated to India due to religious persecution. Some in Manipur oppose the bill for fear that it would cause an influx of migrants in the already resource-burdened state. Others oppose the bill on grounds of religious discrimination — the bill includes a list of protected religious minorities that would benefit from the reform, which includes Buddhists, Christians, Hindus and Sikhs, but not Muslims. Meanwhile in Rajasthan, ethnic Gujjars staged large-scale labor protests to secure stronger protections for jobs for Gujjar workers under state statute. Along with other tactics, demonstrators conducted a five-day sit-in on a major railway, blocking the track for trains that run between Delhi and Mumbai. This led to a day-long shutdown of mobile internet services, also on February 11. And in Jammu and Kashmir, networks went dark in the Kashmir Valley when Indian PM Narendra Modi visited the conflict-rattled area on February 3. This is nothing new for residents, who have been the worst affected by India’s internet shutdown blitz over the past two years. In 2018 alone, the New Delhi-based Software Freedom Law Centre documented 65 mobile internet shutdowns in Jammu and Kashmir. Maria Ressa, the founding editor-in-chief of independent media site Rappler and CNN’s former bureau chief for Manila and Jakarta, was arrested on February 13 after the Philippine Department of Justice filed charges of “cyber libel” against Rappler, Ressa and former Rappler staffer Reynaldo Santos. The charges stemmed from a complaint from businessman Wilfredo D. Keng about a 2012 Rappler story that linked Keng to illegal drugs and human trafficking. On February 12 and 13, internet experts from Venezuela reported multiple unusual incidents on key websites for people and politicians that oppose the Maduro government. The official website of Venezuela’s National Assembly has been offline and online intermittently, on both domestic and international networks. The more peculiar incident occurred on VoluntariosxVenezuela, an opposition-aligned organizing platform for Venezuelans seeking to bring food and medical supplies to people in need. On February 12, people trying to access the site over Venezuela’s state-owned internet service provider, CANTV, found that when they entered the accurate URL for the site [voluntariosxvenezuela.com], they were automatically redirected to voluntariovenezuela[dot]com, an imitation of the real thing. Technical evidence gathered and reported by Andres Azpurua at VESinFiltro indicated that the redirect resulted from a DNS spoofing maneuver, with the likely objective “phishing” or collecting the personal data of people interested in opposition activities. The imitation site, which was hosted by Digital Ocean, is no longer accessible. VESinFiltro and NetBlocks both reported that Google services, including YouTube, have been intermittently unavailable on CANTV as well. On February 8, Facebook banned 732 accounts that bore the name of Bangladeshi Prime Minister Sheikh Hasina and were reportedly spreading rumors and false information. According to government sources, the removals came at the request of the National Telecommunication Monitoring Cell. In contrast to other recent mass account removals on “disinformation” grounds (in Iran, Indonesia and Myanmar), this was not reported on Facebook’s company blog. In January 2019, five people were arrested in Bangladesh after they created Facebook accounts under the names of the PM and her family members, and allegedly used the accounts to spread disinformation and engage in financial extortion. The Vietnamese blogger Truong Duy Nhat, who writes a political commentary blog for Radio Free Asia, has not been heard from since January 26. Nhat had traveled to Bangkok on January 25, to apply for an asylum with the United Nations High Commissioner of Refugees. The number of people using the internet in Uganda has dropped by more than 12 percentage points — from 47% to 35% — since July 2018, when the country's so-called “social media tax” was put into force. The scheme requires people to pay a daily tax in order to use social media and IP-based chat services like WhatsApp. For many, the tax violates freedom of speech and creates a burden of double taxation, as citizens already pay a tax on data bundles to access the internet. Before it was imposed, opposition members of parliament, journalists, activists and the general public argued that the tax would lock thousands of people out of online services — especially youth, who make up more than 70 percent of the population. Internet usage data from the third and fourth quarters of 2018 seem to prove their point. Ellery Roberts Biddle, Marianne Diaz, Rohith Jyothish, Rezwan Islam, Mong Palatino, Georgia Popplewell and Laura Vidal contributed to this report.